Bicruciate-stabilised total knee arthroplasty (BCS-TKA) uses a dual-post-cam mechanism as a substitute for the anterior cruciate ligament and posterior cruciate ligament (PCL), with the surface geometry providing additional guidance for axial rotation and posterior translation. However, the effect of weight-bearing on the kinematics of BCS-TKA has not been investigated. Therefore, the aim of this study was to clarify the effect of weight-bearing on the kinematics of BCS-TKA during high-flexion activities. 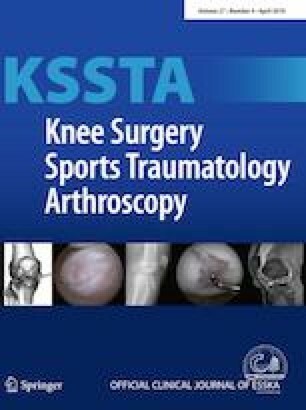 The kinematics of 11 BCS-TKAs were evaluated under fluoroscopy, with two- and three-dimensional image registration, during squatting weight-bearing and active-assisted knee flexion non-weight-bearing. The following variables were measured: knee range of motion, axis of femoral rotation relative to the tibial component, anteroposterior (AP) translation of the medial contact point, kinematic path of the joint surfaces, lateral femorotibial contact point, and anterior and post-cam engagement. The weight-bearing condition did not influence the range of knee flexion, axis of femoral rotation, medial pivot pattern during early flexion, or bicondylar rollback beyond mid-flexion. With regard to AP translation, both the medial and lateral contact points had more posterior locations in weight-bearing than in non-weight-bearing at the mid-flexion angle. Anterior engagement was identified in 6/11 knees (54.5%) in weight-bearing and 4/11 knees (36.3%) in non-weight-bearing. Post-cam engagement was observed in all knees, with the angle of flexion at engagement being larger in weight-bearing than in non-weight-bearing. Although weight-bearing resulted in a posterior location of the medial and lateral contact points of the BCS-TKA design compared with non-weight-bearing in the mid-range of knee flexion, the amount of anterior translation was small overall. Therefore, BCS-TKA provides good stability during high-flexion weight-bearing activities. However, BCS-TKA is associated with high rate of the anterior engagement during early flexion. Therefore, understanding a patient’s activities is an important factor when selecting the most appropriate TKA method. The online version of this article ( https://doi.org/10.1007/s00167-019-05375-9) contains supplementary material, which is available to authorized users. Institutional review board approval was received for this study.